Mary Johnson, the principal of McGinnis Woods Elementary School has been involved in education throughout all of her adult career. She began teaching immediately upon earning her BA in Elementary Education from Wheaton College, taking a short hiatus upon the arrival of her children. Mary has taught many grade levels in both the public and private sector and has learned from serving on many committees through the years. Mary earned her Masters Degree in Curriculum and Instruction from National Louis University in Chicago, Illinois and her Educational Leadership add-on through the University of Georgia. Mary has been with McGinnis Woods since March of 2001 and has taught and served as Curriculum Director during her tenure. 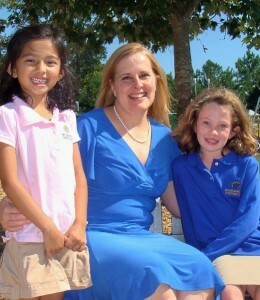 She was honored as Teacher of the Year in 2004. Mary was appointed Principal during the 2005-6 school term. Mary’s love for teaching, knowledge of curriculum and vast experience in education has provided the tools necessary to foster unity and vision amongst the staff, parents and students at McGinnis Woods. Mary believes that every student should be given the opportunity to learn and succeed in a warm and caring environment, which continually fosters a love and curiosity for learning. She believes that the curriculum at McGinnis Woods provides the students with daily opportunities and the tools to explore the world around them in hands-on, relevant ways encouraging growth in developmentally appropriate settings. As principal, Mary oversees the daily operations, personnel and instruction at the school. She is energized by students and their enthusiasm for life. She also enjoys the relationships she shares with the children’s parents and her amazing staff. Mary encourages parental involvement and welcomes parent ideas. She believes that a strong tie between home and school is essential to each child’s success.